Yoga is an ancient practice that has been passed down over generations through oral tradition. There are many different types of yoga that have evolved over time, all with their own unique qualities and benefits. The majority of styles focus on breathing exercises along with structured poses that help align the body physically and spiritually. Choosing a style that’s right for you is a matter of evaluating your current fitness level and having a purpose in your exploration of a yoga practice. While there are many more styles than are listed here, these are the most popular types of yoga in practice today. One of the more physically demanding types of yogas, Ashtanga — or Power Yoga — is based on a series of poses increasing in difficulty. As you flow from one pose to the next, your body will generate a lot of heat, causing you to sweat. Aside from increased flexibility and mindfulness, Ashtanga also burns a ton of calories, which is great if you’re trying shed a few extra pounds. A hot yoga style, Bikram Yoga is done in a heated space, which can be anywhere from 85 to 105 degrees Fahrenheit. The elevated temperature is said to decrease the risk of injury, help you sweat out toxins and even increase flexibility. All Bikram classes consist of the same format: a 90 minute session performed with 26 different postures in addition to breathing exercises. 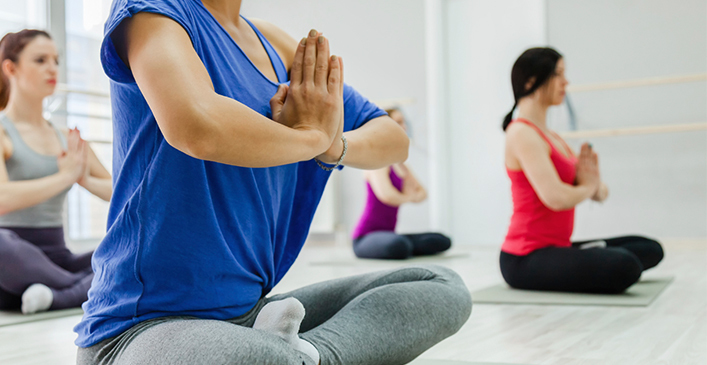 Hot yoga is not for everyone and can be risky for those with pre-existing medical conditions or prior heat sensitivity. Hydration before and after a session is key. Hatha Yoga is probably the most popular type of yoga, at least in the United States, and is great for beginners. It is a slower kind of yoga that focuses more on perfecting poses in addition to breathing techniques and meditation. Hatha aligns the body, mind and spirit and may include chanting as well. Sometimes small blocks or bolsters are used to get into a correct pose, which helps minimize injury. Physical balance along with internal balance between male and female energies are also a focus in Hatha Yoga. Similar to Hatha, Iyengar is yoga for the perfectionist or the injury prone. Poses are held for a longer period of time as focus is given to the proper anatomical alignment of the body. Because there is more of a focus on the body, Iyengar is great for injury recovery as it strengthens and stabilizes you from head to toe. Props are used to modify poses specifically for your body type and increase access to positions outside your normal flexibility. Belts, benches and blocks are all used in Iyengar Yoga. One of the more popular forms of yoga among celebrities and the like is Jivamukti. It incorporates meditation, chanting and music, along with physical poses, bringing together a stimulating practice on your way to enlightenment. Five tenets, or philosophies, are presented in every class, which help remind yoga students of the original meaning of yoga: connection to the Earth. Animal rights advocates and practicing vegans or vegetarians are drawn to this type of yoga as one of their core concepts revolves around these themes. A more traditional type of yoga in its connection to spirituality is Kundalini Yoga. Through poses, breathing exercises, mantra chanting and meditation, Kundalini activates all parts of your being. Its name refers to the kundalini energy that resides at the base of the spine. When activated, this energy travels up the spine through the chakra centers of the body and out of the top of your head. Experiencing kundalini energy is described as a type of spiritual enlightenment that causes a rise in consciousness and an extreme state of bliss or love. When most people think of yoga, they are thinking of Vinyasa. It’s a faster paced version of Hatha Yoga that is more fitness-oriented as the flow of poses creates a cardio workout when done correctly. Each movement in Vinyasa is done with a breath. Anytime a body part moves upward, you breathe in; when it moves downward, you breathe out. The emphasis is on poses in Vinyasa, including impressive feats of upper body and core strength like handstands, headstands and arm balances. Experimenting with different types of yoga is a great way to figure out which is right for you. Some teachers will be better than others, supporting you as an individual and not just a student. If you’re serious about practicing yoga, it can be a lifelong endeavor that will benefit you inside and out.